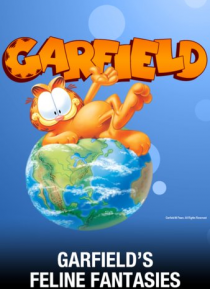 "The world is filled with excitement," Garfield tells Odie. "If you just use your imagination, you don't even have to go find it. It'll find you." And so it does, beginning with Garfield's dream that he's a submarine commander in combat, and continuing with reveries about a Wild West showdown and airborne heroics. But Garfield's most elaborate fantasy is a spoof that melds "The Maltese Falcon" wit… h an adventure worthy of Indiana Jones. In this daydream, Garfield imagines that he's Lance Sterling, a droll soldier of fortune accompanied by his faithful associate Slobber Joe (Odie) on a Middle East mission. Their assignment: recover the stolen Banana of Bombay, the source of the old banana peel sight gag and therefore "the symbol of humor to nations around the world."